Hall of Fame trainer Bill Mott said he has a plan for the Grade 1, $1.5 million Belmont Stakes for Hofburg to have a chance to play spoiler when Justify attempts to become the 13th Triple Crown winner. Mott has been through these races before, coming up a winner in 2010 with Drosselmeyer at odds of 12-1. This time, the 64-year-old trainer from South Dakota, saddles a 3-year-old colt tabbed the 9-2 second choice behind Grade 1 Kentucky Derby and Grade 1 Preakness winner Justify. Hofburg seems to be well bred for the distance. He is by Tapit, the sire of three Belmont Stakes winners, including Tapwrit last year. On his dam side is Touch Gold, who won the 1997 Belmont and spoiled the Bob Baffert-trained Silver Charm’s quest for a Triple Crown. Hofburg finished eighth in the Derby under Irad Ortiz, Jr., then skipped the Preakness and returned to Saratoga to train up to the Belmont. The Juddmonte Farms chestnut made the trip downstate on Monday, and has acclimated well. “We got real lucky with the weather. He had a good trip on a dry road,” said Mott. “We’ve been through the paddock and he’s good. He was on the race track this morning; wasn’t too aggressive, pretty relaxed. 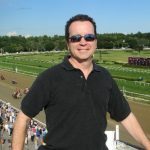 Mott reported on two other horses he’ll saddle on Saturday, Good Samaritan in the Grade 1, $1.2 million Runhappy Metropolitan Handicap and Channel Maker in the Grade 1, $1 million Woodford Reserve Manhattan. The 5-2 favorite for the race is Mind Your Biscuits, with Bolt d’Oro the second choice at 4-1 in the field of 11. Channel Maker comes into the 1 ¼-mile Manhattan on the turf looking for his first victory in four starts this year. The son of English Channel will be ridden by Jose Ortiz and is 20-1 on the morning line. Channel Maker finished fifth in the Grade 1 Old Forester Turf Classic Stakes at Churchill Downs on May 5. The Wachtel Stable and Gary Barber owned 4-year-old has two wins, three second and three third from 16 career starts, with earnings of $516,250. According to Hall of Fame trainer D. Wayne Lukas, Belmont Stakes contender Bravazo has settled in nicely and taken well to “Big Sandy” since arriving by van on Monday. Early Wednesday morning, he resumed his light, local preparation for the “Test of the Champion” with a routine gallop as he continues to assert himself as a legitimate threat to thwart Justify’s Triple Crown bid. No horse has come closer to besting the undefeated Justify than Bravazo in the Preakness – in which he fell short by a half-length over a sloppy, sealed track at Pimlico – and if things had gone a bit differently, Lukas said his horse may have been the one to wear the Black-eyed Susans. 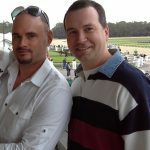 In the early stages of the Preakness, Bravazo was sitting in the catbird seat as Justify and Good Magic, the Kentucky Derby top-two finishers, duked it out on the lead. Around the far turn, the Calumet color-bearer dropped back a few lengths with no apparent mishap, only to re-emerge from the fog in deep stretch and nearly nail Justify on the wire. Bravazo – the only horse in the Belmont other than Justify to have contested both the Kentucky Derby and Preakness – is tied with Blended Citizen as the most experienced horse in the field, with 10 starts under his belt, including five this year. This added seasoning may be just what he needs to turn the tables on his ballyhooed rival, according to Lukas. Should Bravazo run according to his pedigree and navigate the 1 ½ miles of the Belmont oval faster than his nine rivals, it would give Lukas a record 15th victory in a Triple Crown race. Live Oak Plantation’s multiple Grade 3 winner Awesome Slew returns to Belmont Park for Saturday’s $1.2 million Runhappy Metropolitan Handicap with another chance to fill what trainer Mark Casse said is the only blank spot on the 5-year-old’s resume – a Grade 1 victory. A Florida-bred son and grandson of two-time Grade 1 winners Awesome Again and Seeking the Gold, Awesome Slew is the only one of 11 graded-stakes winners entered for the 125th Met Mile to have run in last year’s race, finishing fourth. As he did in 2017, Awesome Slew drew the far outside post for the Met Mile, though one spot closer than last year. He has raced twice this year, both at seven furlongs, finishing second as the favorite to Army Mule in the Grade 1 Carter Handicap April 7 at Aqueduct in his first start in five months. Awesome Slew followed up to be third by a neck in the Grade 2 Churchill Downs May 5 on the Kentucky Derby undercard, contested over a sloppy, sealed track. The two horses that finished in front of him, Limousine Liberal and Warrior’s Club, both return in the Met Mile. “It’s an extremely tough race but that’s why they’re Grade 1s, right?” Casse said. “He’s doing extremely well. I thought his first race back of the year, we kind of felt like he was training better than ever. Obviously, he ran into a very good horse in Army Mule. I thought he ran well, had a wide trip. Though winless in two career tries at Belmont, including a second to probable Met Mile favorite Mind Your Biscuits in the 2017 Grade 2 Belmont Sprint Championship, Awesome Slew has been successful going one mile, winning the Grade 3 Ack Ack last fall at Churchill Downs. 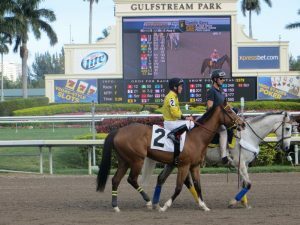 Also last year, he was second in the Grade 2 Gulfstream Park Handicap and third in the Grade 1 Breeders’ Cup Dirt Mile. Awesome Slew also owns a win at 1 1/16 miles, going all the way on the lead to beat 13 rivals in the Grade 3 Smarty Jones in 2016. A member of the Canadian Racing Hall of Fame and a finalist for the second straight year in 2018 for enshrinement in the National Museum of Racing’s Hall of Fame, Casse won the Met Mile in 2001 with another Florida-bred, Exciting Story.